Most of my past projects have focused on leveraging games and gamification in the K-12 classroom with students, however, a project specifically for teachers is long overdue. 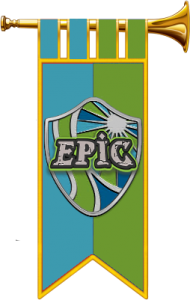 EPIC Teaching Academy, turns the attention to educators and their professional development. Though, I’ve tossed these ideas around for awhile and even built a loose framework, my new district, Surry County Schools, is truly the right-place, right-time to launch this project. There’s been incredible support. 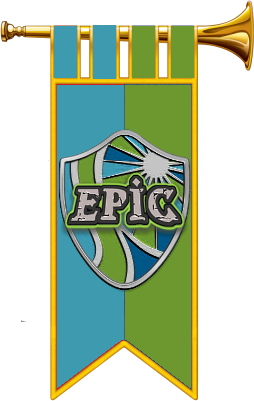 So, what is EPIC? It’s really the result of some conversations and observations over the past several years in my primary role as a provider of teacher professional development. The catalyst was a conversation two years ago at EdCamp Raleigh. There, a group of educators from across the state including Bill Ferriter (@plugusin), Bethany Smith (@bethanyvsmith), and many others talked about what we, as educators dislike about professional development and what we really want in our PD. It was an incredible conversation, as most are at EdCamps. Of course, I have my niche passions within the education arena, so instantly began to see opportunities to leverage a playful, game-like approach as a solution to many of the problems the group had with typical professional development. 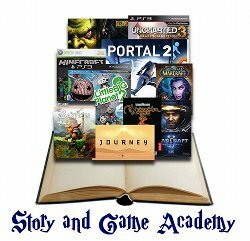 EPIC Teaching Academy is program I’m developing, using 3DGameLab as a platform, that will offer players (yes, players) the opportunity to explore professional development topics of their choice to a depth of their choice. These learning quests will increase in complexity and commitment as players progress through successive quests as they progress toward unlocking an official badge showing their mastery of a particular topic. These badges can be shared through the educator’s website, social media, and/or badging system like Mozilla’s Backpack. 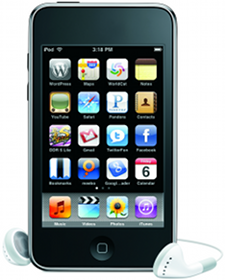 Of course, my ultimate goal is to move beyond simple gamification toward truly game-like experiences. Perhaps a hidden Easter Egg (a la Ready Player One)? Perhaps we’ll divide schools into teams like a local Hogwarts to host some fun, competitive learning experiences? Likewise, a hope is that our educators, through this experience, will gain a greater understanding of the merits of an approach like this, ultimately paving the way for student badging. Here, my friend, Dr. Bron Stuckey (@bronst), has offered some great starters and inspiration! Tomorrow I’ll begin recruiting district teachers to participate in a pilot beginning in February. Along the way, I hope to collect some data, pre- and post-, of their attitudes toward professional development overall and of the EPIC experience. UPDATE (2/2/15): The pilot launched today!! Out of 50 available slots, 47 were filled. There are a good mix of elementary, middle, and high school teachers along with media specialists, administrators, counselors, and others. 40+ quests are available to our teachers at launch and two official badges: one for Twitter as a tool for growing your PLN and one for professional blogging. There are 30+ Achievements and numerous Awards, too. In total, nearly 2.0 CEU’s worth of content is out there for them to explore. Lastly, yes, I was able to develop a hidden game-with-the-game with clues and activities hidden throughout! More updates to come as we move forward! If you haven’t read the recent issue of THE Journal, be sure to take a look at the article. 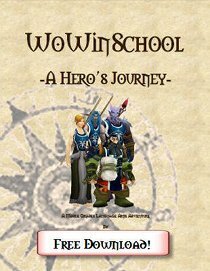 It’s a great discussion of how the Cognitive Dissonance Guild is supporting educators’ explorations in the virtual world, World of Warcraft. There’s also discussion of our very own WoWinSchool Project!